Advanced Land Observing Satellite "DAICHI" will be used for precise land coverage observation. The Advanced Land Observing Satellite "DAICHI" (ALOS) has been developed to contribute to the fields of mapping, precise regional land coverage observation, disaster monitoring, and resource surveying. 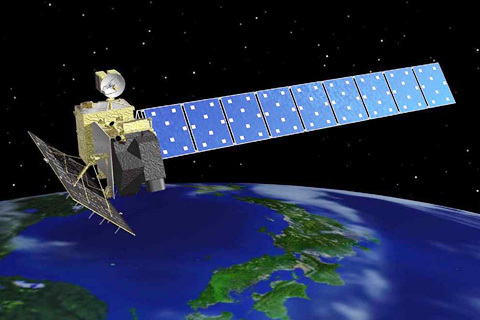 It enhances land observation technologies acquired through the development and operation of its predecessors, the Japanese Earth Resource Satellite-1 (JERS-1, or Fuyo) and the Advanced Earth Observing Satellite (ADEOS, or Midori). ALOS has three sensors: the Panchromatic Remote-sensing Instrument for Stereo Mapping (PRISM), which is comprised of three sets of optical systems to measure precise land elevation; the Advanced Visible and Near Infrared Radiometer type 2 (AVNIR-2), which observes what covers land surfaces; and the Phased Array type L-band Synthetic Aperture Radar (PALSAR), which enables day-and-night and all-weather land observation. "DAICHI" will be used not only for cartography, but also for regional and disaster monitoring. DAICHI's remote-sensing equipment enables precise land coverage observation and can collect enough data by itself for mapping on a scale of 25,000 to 1. without relying on points of reference on the ground. It is expected to play an important role in cartography by providing maps of Japan and other countries, including those in the Asia-Pacific region, which is one of ALOS's main objectives. Other objectives include regional observation for harmonization between the environment and development on Earth, domestic and overseas disaster monitoring and resource surveys. Its contributions to the mitigation of environmental destruction and natural disasters will make it an essential satellite for our future. It was launched by the H-IIA launch vehicle No.8 from the Tanegashima Space Center (TNSC) in January 24, 2006. 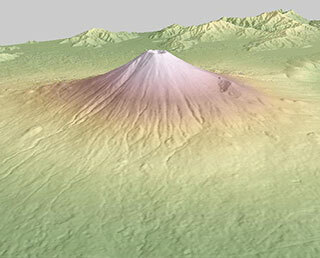 Since its launch in Jan. 2006, DAICHI's observation data has been used in various areas including disaster mitigation through observing regions damaged by earthquakes, tsunami, or typhoons, as well as carrying out forest monitoring,natural environment maintenance, agriculture, and compiling a 1/25,000 topographical map. In its 5-year operation, it shot 6.5 million scenes all over the world. When the Great East Japan Earthquake hit Japan in 2011, the DAICHI took some 400 images over disaster-stricken areas to provide information to all parties concerned. After being in operation for three years of its designed life, it further worked for an extended period over its target period of five years. However, on April 22, 2011, a power generation anomaly caused a communication loss. At 10:50 a.m. on May 12, 2011, JAXA sent a command to stop the onboard transmitter and batteries of the DAICHI from the ground station to complete its operation.